Chris Bennett would rather be surfing than running…but he’s got good reasons to run the AF Canyon Run Against Cancer. (And only one of them is to beat his brother-in-law). Chris Bennett is an athletic guy…but surfing is his sport of choice. He has bad knees. He’s never run a half-marathon before. He doesn’t even like running, to tell the truth. And yet, he’s going to run AF Canyon Run Against Cancer half marathon this year. He’s got his reasons. For example, 97thFloor — the company he’s CEO of — is the title sponsor of the event. And more importantly, he’s got a plan for beating the COO of the company through some very intense training. And most importantly, he’s doing this race for a reason a lot of us can identify with: cancer has hit too close to home, too many times. Chris is an all-around athlete, having run several 10Ks and obstacle races, but surfing is what he really loves. This will be his first half-marathon, and he is not a fan of long runs. “I have bad knees from basketball, so the less long-distance running I can do before the race — but still be prepared — is what I'm trying to shoot for,” he says. 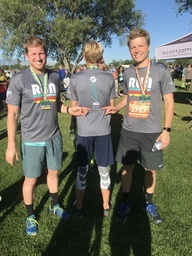 So, since Chris is not a huge fan of running, how did 97th Floor — the company he’s CEO of — become the title sponsor of the AF Canyon Run Against Cancer? “I grew up very lucky,” says Chris, “not having any cancer stories close to me. So for a while I kind of escaped that. But cancer has definitely hit close to home. And that’s a big part of why 97th Floor not only supports this event, but also donates part of its “One Percent” initiative — where 97th Floor donates one percent of its gross income to a charity of its employees’ choosing — to the AF Canyon Run Against Cancer.